We know how difficult it can be to choose a saddle, or to be sure that it will keep working for you. Our two-week test ride program is free except transport, and is followed by a rental option that gives you more time to make up your mind. We move at your speed. Start by letting us know that you'd like to test a saddle. We'll send you a measuring and photo guide or - if you like - a measuring kit. When you're ready to get going, we'll ask for a detailed conversation with our expert staff. These folks - all riders ourselves - will guide you through the different saddle models and technological components so that the saddle (or two!) we send you will be selected just for you and your horse. If you are close to one of our certified saddle fitters, you may choose to have an in-person fitting. Or you may opt for our Remote DIY Fitting, where you are guided through saddle adjusting over a video/phone link. One hour later, you'll be testing out your EQ saddle! Before, during and after your saddle trial, whether over the phone or via email, we're here to answer all your questions competently and thoroughly. Ninety percent of the folks who try EQ buy EQ. That statistic speaks for itself. 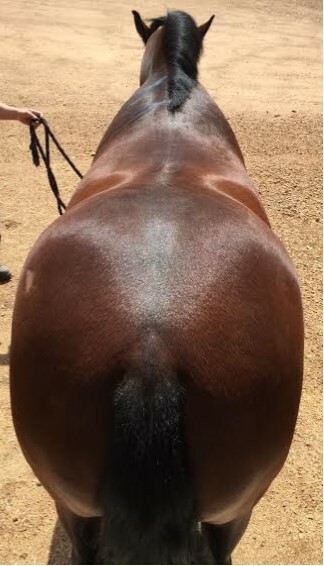 Photos, including one taken from above/behind, show the shape of the shoulders and the swell of the barrel.